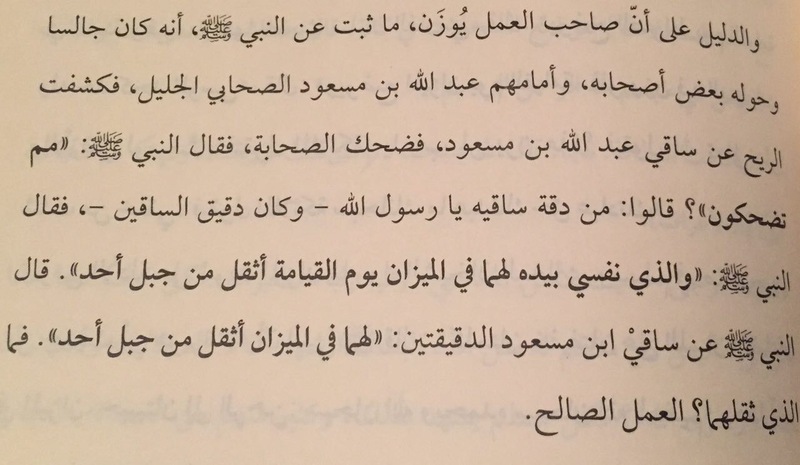 And the proof that the person who performs the deeds will be weighed (himself), is what has been established on the authority of the Prophet (‫صلى الله عليه و سلم‬) that he (صلى الله عليه وسلم) was sitting (one day) and some of the companions were around him. In front of them stood the noble companion 'Abdullah Ibn Mas'ud. Then (suddenly) the wind revealed the shins of 'Abdullah Ibn Mas'ud whereupon the companions started laughing. "About his thin shins, O Messenger of Allah." And he (Ibn Mas'ud) used to have very thin shins. "By the One in Whose Hand is my soul, indeed they (his shins) will weigh heavier on the scale on the Day of Judgement than the mountain Uhud!" "They (his shins) will weigh heavier on the scale than the mountain Uhud!" So what is it that made them heavy? ​Source: Explanation of Usool-us-Sunnah, page 93. View a scan of the page here.